A few pop-up morning showers and storms, but they will kick out of here pretty quickly. The loop above is from 3AM until 5AM. This afternoon more pop-up showers and storms. 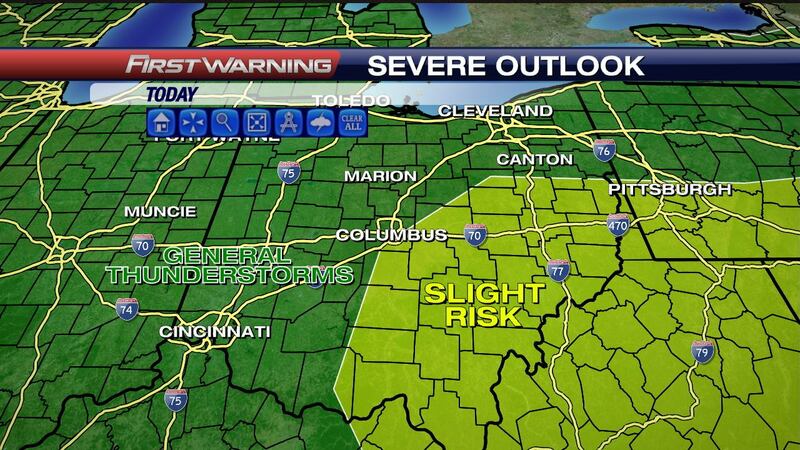 There is a slight risk for severe weather across the Southeastern portions of Ohio. The main threat will be hail and strong winds. The showers and storms will pop up for the afternoon, but weaken once the sun sets tonight at 9:04PM. 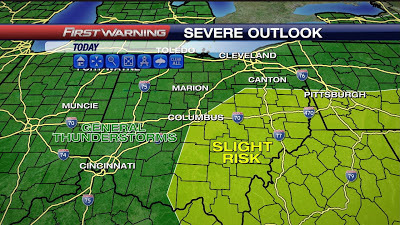 Saturday will be the wettest day of the weekend with afternoon scattered showers and storms. Sunday will still have a few isolated showers and storms. The good news is that the weekend will be cooler with highs in the upper 70's. Heading into next week we will continue with our pattern of warm, humid days with pop-up showers and storms in the afternoon and evenings. It feels like we are dealing with Florida weather. Can't wait for a strong cold front to blast through and clear this out of here for a few sunny days. But no sight of that anytime soon. Enjoy the cooler weekend and have a good one!